Today we are going to review one of the latest recorders from Plextor. Drives from this company have always been interesting to test, as they have always provided maximum configuration and tuning options for demanding consumers. 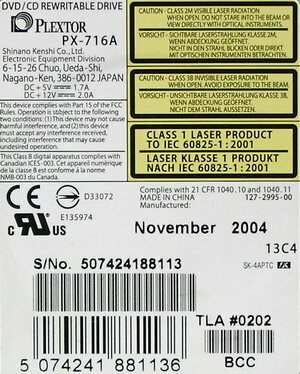 The previous model from this company (PX-712A) was a success and won a high appraisal, the new model outscores it in the number of supported formats and data rates. Unfortunately, the article about this recorder is a tad late and there currently exists a newer firmware version, but most of the information mined in the course of our tests will still be useful. We have got our sample in retail package, its bundle includes the following items: the recorder, faceplate, software CD, IDE cable, several guides. The first thing that jumps you eyes when you look at the drive is that Plextor fell for the general tendency and launched the drive in a shortened format. The front panel of the drive houses a two-color indicator (green/yellow), an emergency eject hole, and the Open/Eject button. The tray is made of black plastic and is equipped with a padding to reduce the noise and dust penetration inside the device. The rear panel of the drive contains an operational digital audio-out. The drive is equipped with a large bunch of proprietary Plextor technologies. Aside from old technologies used in the PX-712A (GigaRec Technology, SecuRec Technology, Silent Mode, Q-Check, VariRec Technology, PoweRec Technology), the model features several new ones. Intelligent Recording provides high record quality at high speeds. Auto Strategy allows to choose an optimal strategy for burning cheap discs unknown to the recorder firmware, which allows the best results when you again use such discs. Intelligent Tilt - 3D control of the laser ray to provide maximum read/write quality. Let's have a look inside the drive, to learn what chipset it uses. The drive is based on a new chipset from Sanyo. 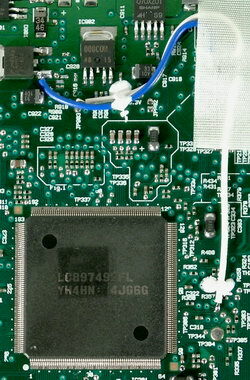 As you can see on the photo, the PCB uses point-to-point wiring, which is usually used to fix PCB errors or in case of updates in a circuit design. The photo below shows the innards of the drive. The installation caused no problems. Users have to go through a standard procedure, like that of an ordinary CD-ROM drive. The drive requires no special drivers. You can do just with installing NeroBurning Rom. But you should install one of the latest versions, because older versions don't always work correctly with the new device. I used Version 6.6.0.3 in the tests. 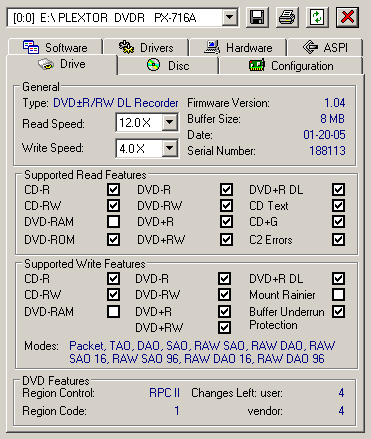 As you can see on the screenshot, the drive is initially RPC-1, but according to www.rpc1.com, there is an option to flash a new firmware version and make this recorder multi-zone (RPC-1). If you want to analyze test results, you may find them here. Silent Mode left only positive impressions on me after I tested the previous PX-712 model. This technology allows to make a drive almost noiseless. So you can imagine my surprise when I started testing the PX-716 and couldn't cope with the noise and vibrations even with the high-quality discs. No matter what I did, the noise and vibration even at minimum speed remained rather high. I suspected that the problem was in the defective drive sample and cleared up this issue in Internet as well as with the manufacturer. The results were not very reassuring. The photo below shows a little assemblage defect that resulted in vibrations and noise. 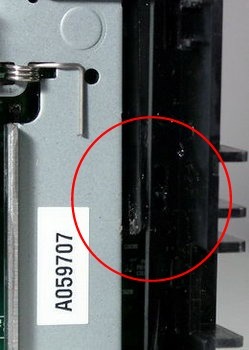 On the left photo you can see that the plastic bar abuts against the metal base, which results in vibrations and noise. It's rather easy to fix it, you just apply a little pressure to it and move it to the appropriate place. There are two such bars in the device, so you'll have to do it from the left and the right sides of the metal base. Unfortunately, the housing is sealed with a warranty sticker. Damaging this sticker may result in the warranty loss. So we don't recommend users to perform this simple operation on their own. Such problems were reported in the drives marked TLA 0202/0203. After this operation the drive expectedly became almost noiseless. There have appeared a lot of cheap DVD-R/+R "No-name" discs on our market. On the one hand it's good, because this state of affairs contributes to the expansion of DVD recorder park, but their cheapness has the reverse side. The majority of these discs are of low quality. Besides, most recorders just don't know how to handle them and use the default burning procedure, which sometimes leads to deplorable consequences. In order to solve this problem, Tayo Yuden has developed the AutoStrategy technology that allows the highest recording quality on "No-name" discs. 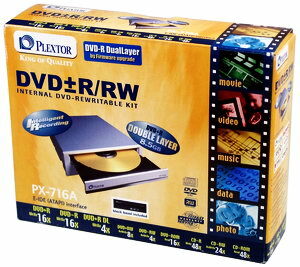 Plextor was one of the first to use this technology in a DVD recorder. Users can control this technology via a special option in Plextools utility. This technology performs a test write/read cycle and uses the results to select optimal parameters to burn a given disc. It reduces insignificantly the burn time, but it can deliver users from damaging discs. In my DVD collection this recorder had no definite burn strategy only for SKY DVD+R, so I used these discs to test the technology. Unfortunately, no miracle happened, I burnt 6 discs with enabled and disabled AutoStrategy and saw no significant improvement in recording quality. But still, there were some positive changes. Here is some KProbe statistics. PI Max. PI Total. PIF Max. PIF Total. 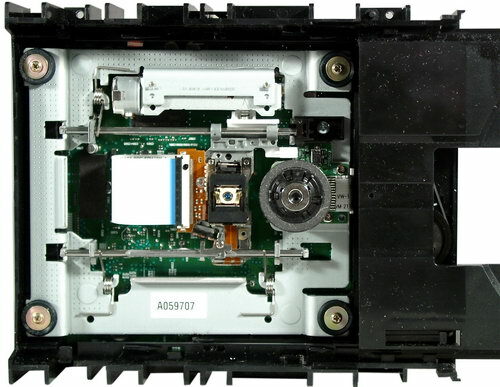 The recorder can burn and read almost all existing DVD types, except DVD-RAM. Let's review peculiarities of this recorder with various media types. 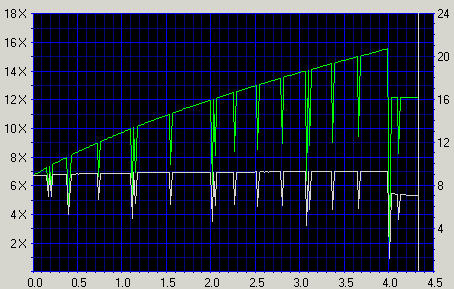 The recorder burns DVD+/-R DL at 6x. It automatically sets Book Type to DVD-ROM, which is necessary to achieve maximum compatibility with old DVD-ROM drives and consumer electronics. The DVD+R DL record quality is generally good, the recorder can handle the majority of currently existing brands. Unfortunately, DVD-R DL media is not yet seen on the market, so I cannot say anything about the burn quality of this media type. Now let's proceed to DVD+R/-R burn tests. The recorder can gather up to 16x when burning this media type, it's currently the maximum possible speed for this media type. This recorder allows to burn some discs at speeds higher than nominal. 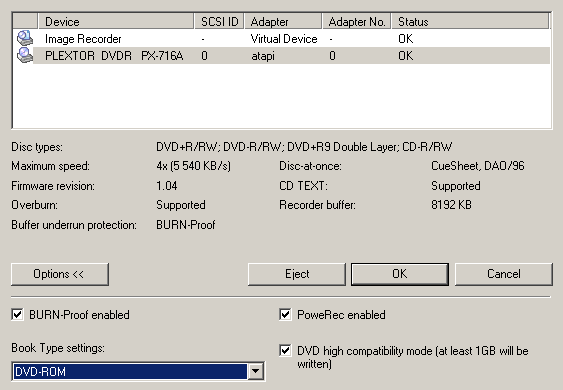 When burning DVD+R/-R discs at 16x, the drive tries to use CAV technology. If the quality control system decides to drop the current burn speed, the recorder can switch to P-CAV mode. As the quality tests of various DVD+R/-R discs showed, the recorder copes rather well with its functions and the results of burning discs of various formats are rather close. But in my opinion, the drive is better at burning DVD+R. The recorder can burn DVD+/-RW discs maximum at 8/4x. In case of proper discs it can use CLV. These days we can find only DVD+/-RW discs on the market, which are designed to be burnt at 4x - alas, new speeds are not available to users yet. We had some problems burning Digitex DVD+R during our tests, perhaps this problem will be fixed in the next firmware versions. The recorder reads various DVD types quite well, it uses the CAV mode. The maximum 16x read speed is obtained with DVD-ROM. When reading recordable DVD, the drive picks up maximum 12x, the same applies to reading double layered DVD-ROM. Thanks to the Silent Mode technology a user can choose the maximum read speed for any media type. CD characteristics of the recorder allow comfortable operations with any CD types. In most cases the recorder uses CAV technology to burn various CD-R media. In this case the burning process starts at 21x and gradually grows to 48x. If the recorder doesn't like the disc, it can use P-CAV technology to burn that disc at maximum 32x speed. CAV technology is used to burn 10x CD-RW; P-CAV is used for burning 24x discs. We had absolutely no complaints about the quality of CD-R/RW discs recorded on this drive, all the discs were easily read by the test drive and the C1 error level turned out quite low. The recorder reads various CD types very well, there were no problems with reading low-quality CDs. The recorder uses CAV technology for reading most CDs, the read speed gradually rises from 24x at the beginning of the disc to maximum 48x at the end. Plextor remains true to itself; as always, its new recorder is the cutting edge model supporting various state-of-the-art technologies and is capable of providing maximum convenience to its users. But that's if we ignore the irritating problem of noise in some recorders, which is probably the fault of assemblers. In future the company should pay more attention to the output quality control of its products. State-of-the-art technical characteristics of the recorder render it a promising purchase and match well the good recording quality of various media. It should be noted that the recording quality of some DVDs had better be improved, but this problem can be resolved on the level of future firmware versions. So we can safely recommend this recorder both for home and office use.